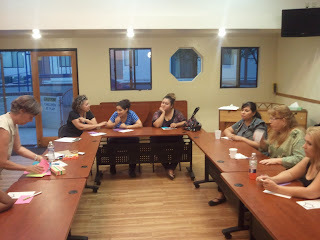 Last week, my husband (the photographer), and I were fortunate to share an evening hour with ten women in a Talk UP^ Tucson… happiness community conversation. I tried a couple of new prompts for this conversation. At a nicely arranged table grouping with refreshments provided by TMM and a staff person to help occupy some of the women's young children, another staff person joined the group and we talked. www.tmmfs.org . I handed out large index cards and a colored marker to each participant, letting them know they would be keeping this card for themselves. First, I asked them to respond to the prompt "Recently I was having a bad day because..." . I gave them the example of my day starting off badly with my lingering cold and cough. Their responses, shared verbally by choice after taking five minutes to write varied from "my car door handle fell off" to "my best friend passed away." Several of the responses drew a supportive "God Bless You", or “I am sorry", and I shared, when appropriate, my feelings for their unhappy experiences. Next, I asked them (on the same card), to write a response to this prompt "But I managed to find a few happy moments in it anyway, like..." . I shared that, in spite of my cold, I was able to laugh at a funny YouTube video with two dogs dancing. Responses to the second prompt, again shared verbally by choice, included: "my boys hug me" or "to pray" or "the paramedics who helped me were cute." Again, we talked a bit more deeply about their responses and the possibility that even a very bad day can have a few happy moments. All of their verbal responses to both prompts I wrote down on a large paper pad framed on an easel. I talked about how a community is made of up of me and at least two others--family members, friends, work colleagues or church companions. I also shared the quote that “a wise person knows ‘enough’ is abundance." (I could not recall the source). Then, I passed out colored medium-sized post-its and asked them to describe an experience where being in a community was "enough." I gave them my example of recently being with a group of other writers. This time I collected their responses (if they were willing to share, and all did) and read them aloud before sticking them to the large paper pad. Responses included: "Faith Singing", "looking at the beautiful children being cared for by TMM...", and "I enjoy my job." As we wrapped up the hour, I asked them, if they were willing, to share one thing they were taking away with them from the conversation. The staff person said she now has the idea of starting a program newsletter; a participant offered to host a Bible study group "now that I see I am not alone", and another said she actually was taking away "four new things" and listed them in sequence. I am always amazed at what I take away from these community conversations: new ideas, hope, strength, and yes, more happiness.